If this is really authentic, I mean if a thorowly test on more than one device with more than one OS etc. would show the same result, would it be possible to reduce the energy taken by locus while tracking? Or could it be some mis-settings in the tracking that Locus consume more energy? - was map screen visible sometimes during a record? If so, then same time on both apps? - were enabled any sensors? Pressure, rotation, gravity? On spare time, I will try this comparison with hopefully similar parameters in both apps. I doubt parallel run of both programs will give reliable results. E.g. sensor usage is sometimes counted wrongly (see viewtopic.php?f=38&t=3005 (sorry, only for Premium members ). Why is CPU usage in the test much higher for Locus (vector maps etc.?)? What are the things Locus does when screen is off? Surely Locus needs to calcuate POI alarm, Guide to, navigation, etc. But no vector map tile calculation, calculation and display of map objects, map items, track shift over screen, etc..
so these 50% (by simulator) really do just from time to time, read a line from text file and parse it. Not much work and it's 50% of CPU that Locus consumed. 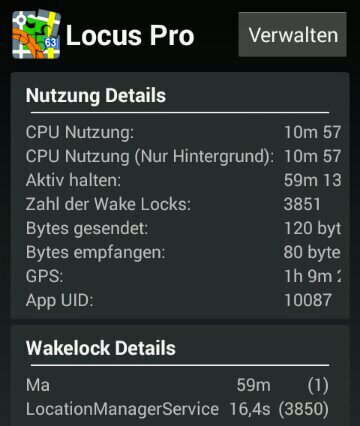 So this mean that locus consume really really small CPU for this task. I just tracked again some track with locus and at the same time with GPSLogger, just to compare energy consumption. So here my battery report as glued screenshot attached. 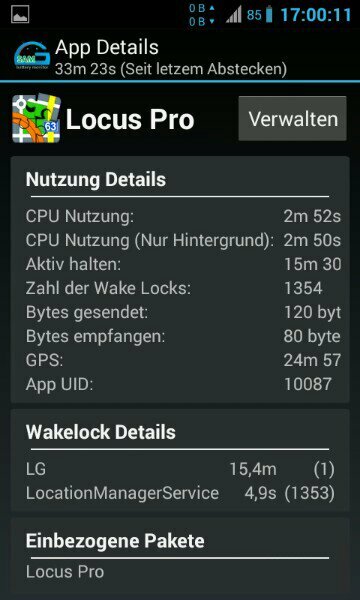 Locus used for about 40 minutes about 6 % of battery, but the other pure tracking app, GPSLogger, didn't even be mentioned in the battery list at all! Is there something wrong with my locus settings then? Should I disable NMEA or how can I get normal tracking results? 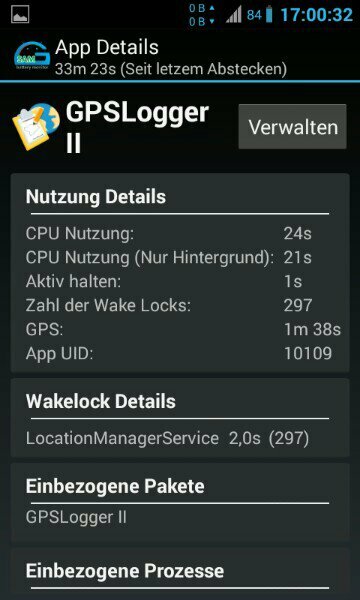 In GPSLogger I use track every 5 seconds (no more settings with this). Can I do something here or is it just better not to use locus track recording if I need low battery consumption? Now I tracked over an hour, without any display use, I started tracking with the widget and stopped it and immediately looked to Battery, this is what I see, 30 % Locus! This is unusable then, this tracking. I must have a setting which pulls the battery empty, or how could that be (see attached Screenshot)? 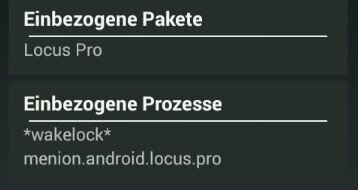 Yes, you surely right, but the test with both apps, Locus and Gpslogger simultaneously tracking the same time and Locus is 30 % and the other app is not even mentioned is a very clear thing. Either I have misconfigured Locus and it should not be mentioned as well, or Locus just needs much more battery. I started my SGS2 with nearly 100% battery and after this tracking was in the fifties % which is much less. I like the tracking of locus, I used to track with locus before, it has this nice export feature. But this huge power consumption for just tracking is too much, unfortunetly. I would not believe those numbers one hundred percent. I don't know how much Locus consumes. But maybe the first app to start GPS will get the penalty and the other one will not receive anything from the GPS consumption. Maybe this wrong. I just started this time for sure first GPSLogger, then, after a minute, locus, starting it over the widget. 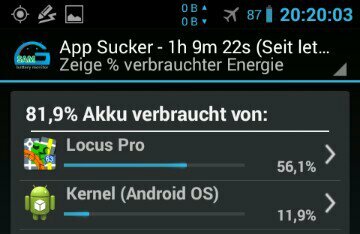 Still I have now 6% battery for locus, not mentioned GPSLogger, all the time screen on with other apps, but never locus. But I guess the real test would be to start locus tracking in airplane mode for an hour with full battery and then look only at the battery percentage loss. Same then with the other tracking app. First I started GPSLogger (II) and only after this, Locus via widget. Stopping the track record again in the end with the widget and then, when Locus pops up, I just deleted the track not to consume battery by auto export. I started with 96% on battery and ended after 25 minutes with 85%. 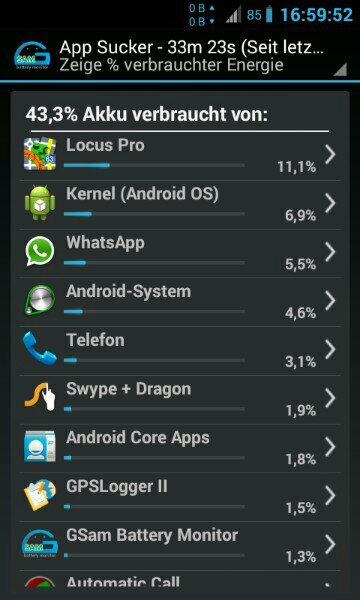 If these 11% are right, then Locus used in one hour about 3% battery. Please tell me that I MUST have some misconfiguration in Locus, because this cannot be that Locus consumes so much, can it? What can it be that makes locus so hungry? 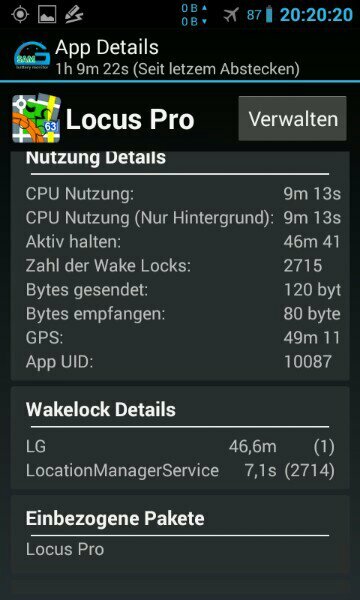 hmm and why Locus has during 33m power on, turned GPS on only 24 min and your second app only a minute?? Anyway as you see, during that time, Locus spend 5x times more time by some CPU operations. This is what I don't understand, WHAT in hells and heavens name is locus doing all the time using CPU? It just need to track. What could that be, that is running with this track-recording in Locus? 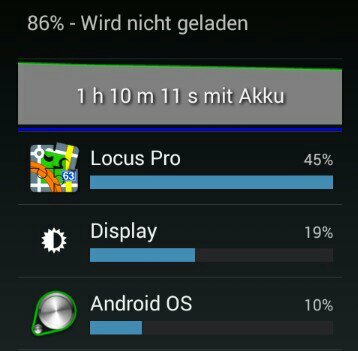 And beside this, even when Locus needs 3% an hour, this would mean 30% for ten hours, which I would never reach, never. The system would drain the battery much earlier, not a 3% an hour App. Would mean maybe 10 minutes more tracking, I guess, if Locus would consume only 0.3%, like a smaller tracking app (a "bicycle"). 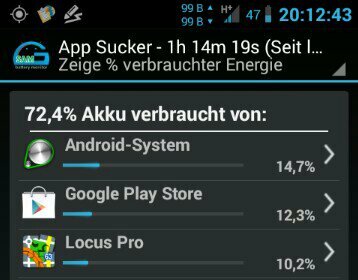 In 50 minutes, Locus consumed 56% from 6% of the battery as Gsam reports (or 45% of 7% in 70 minutes as OS reports). This was measured with airport mode on. I am now sure, GPSLogger II consumes about a tenth of it, but all in all its not much. Will be only interesting for long time tracking, I mean tracking for several hours or even a day. There I won't be able to use locus if I have not a bunch of spare and full batteries with me. Locus is just not a tracking app.